Hosted by JEDA(Japan EOS Developer Association), a newly established general corporation, held an EOS large meeting up at the University of Tokyo campus on May 8, 2018. 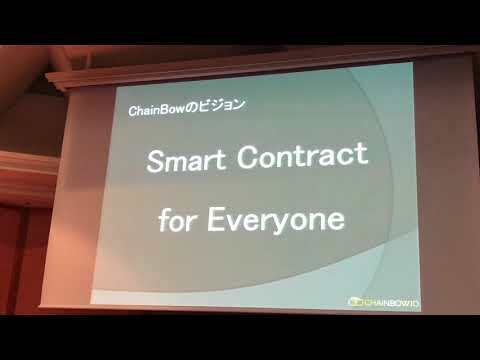 Yamato Sakai, co-founder of COIN OTAKU introduced the ChainBow.io project. ChainBow.io is a next generation cryptocurrency smart wallet solution, a new project that started this March. ChainBow.io's vision is listed firstly as "Smart Contract for Everyone" and it greatly supports the EOS ecosystem. There are three functions of ChainBow.io mentioned by Sakai as follows - asset management, payment and Smart Contract. He also listed four points on the features of EOS Wallet, which is under development. Again, the fact that transactions are free of fee and the strengthened robustness of the security which is becoming a hot topic in recent years are emphasized. Sakai mentioned not only that Mt.Gox and CoinCheck, but also that daily hacking happening everyday in the world, appealing the importance of security measures. In addition, as a feature of ChainBow.io Wallet, a breakthrough function that users can control Smart Contracts themselves was introduced.